The basic rule of driving involves adjusting the side and rear view mirrors to get into a comfortable seating position so you are good to go. Many times though, you suddenly see a car right next to you and wonder how fast it got there without your prior notice. This car was always there, it is just that you did not see it earlier because it was in the blind spot position of your car. Therefore it is important to know how to install blind spot mirror in your car and this guide will enlighten you. Wrongly installed blind spot mirrors are the reasons for many accidents occurring every day. The blind spot mirror is easily found online or at the local auto parts stores and car workshops and it is very reasonably priced. Blind spot mirror installation is a step by step ​work. If you follow this step properly then it wiil be installed properly at the first attempt. Adjust the side view mirrors properly. Try to set the mirrors at a position which naturally makes the blind spot minimized. Clean and dry the glass of your side view﻿﻿﻿ mirror﻿﻿, as the blind spot mirror will be installed there. It is important to completely dry off the glass before starting to install the mirror. Choose the place for mirror installation. The best place to install the blind spot mirror is either on top outsider corner or the bottom outside corner of side view mirror. The blind spot mirror comes with a sticky surface on the back of the mirror, which enables it to stick on the glass surface. Peel off the paper sticker at back of the mirror and stick it on glass. Once the blind spot mirror is stuck in its right place, use a towel or a small piece of soft material or cloth to rub and press the mirror against the side view mirror glass. This will ensure that the mirror has been stuck to the glass of side view mirror properly and firmly. 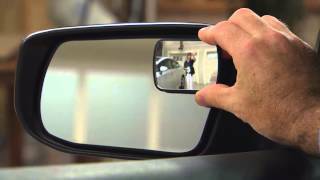 These simple steps will help you know how to install a blind spot mirror to your car within no time. ​Do Blind Spot Mirrors Work ? Someone asks, are blind spot mirrors useful ? Someone asks ​Do Blind Spot Mirrors Work? I answer, Not only useful it's mandatory to have a blind spot mirror in every cars, suv or any vehicle. Not all the drivers are prompt enough to pull back the car before it hits into the other car. So to avoid the potential threat of ending up in accident, it is important to have the blind spot mirror properly installed. From my longtime practical experience, i've seen that blind spot mirrors can be put at all different places on the regular side mirrors. Mainly it depends on your mirrors setup. If you have conventional type mirror set up then you can put your blind spot mirror top inside or outside closest to the car. You can also put it bottom inside or outside closest to the car. ​These simple steps will help you know how to install a blind spot mirror and where to put a blind spot mirror on your car within no time. ​However, it is always sensible to be extra careful while driving. It is a good practice to slightly turn around and look at the cars behind even if you have the blind spot mirror installed in your car.